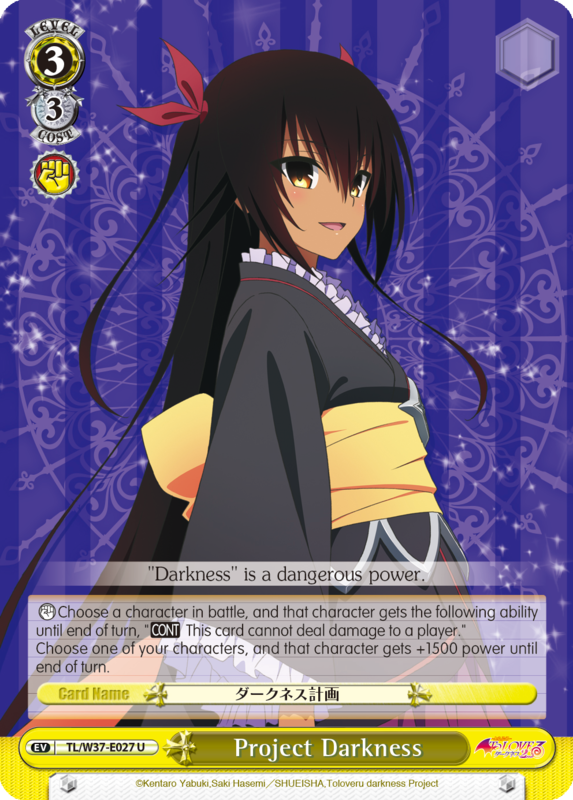 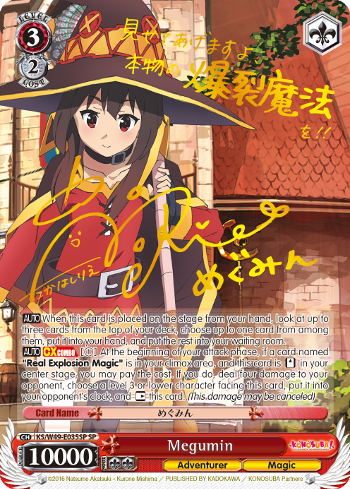 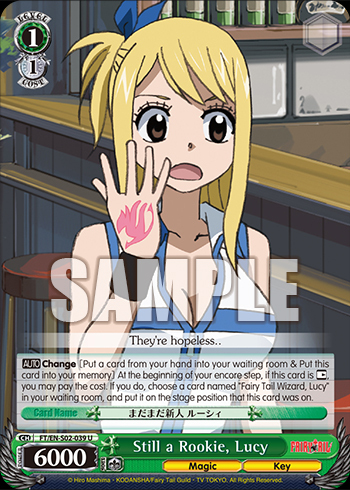 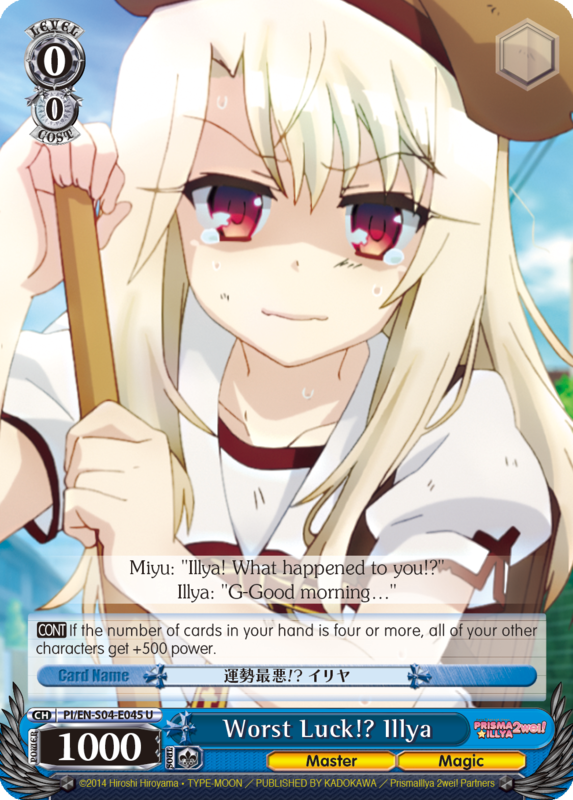 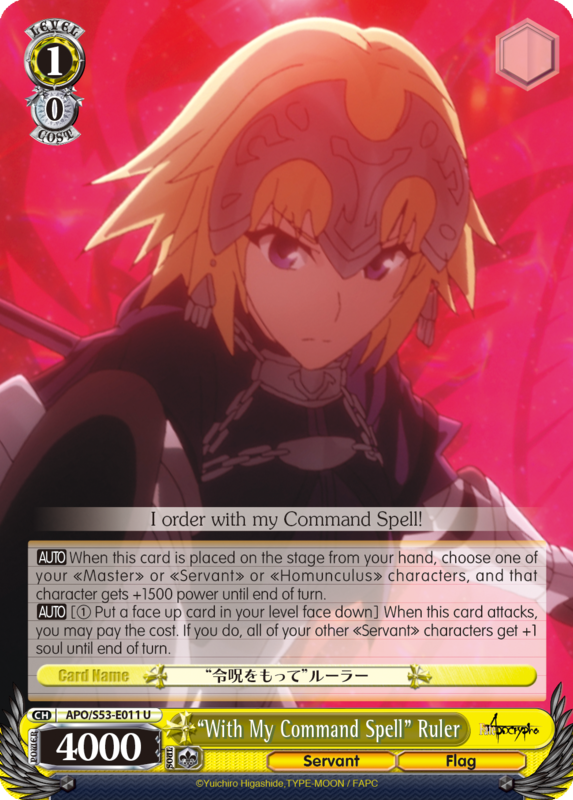 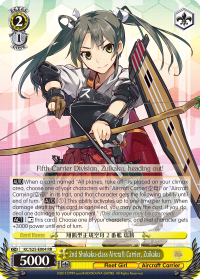 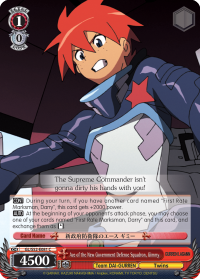 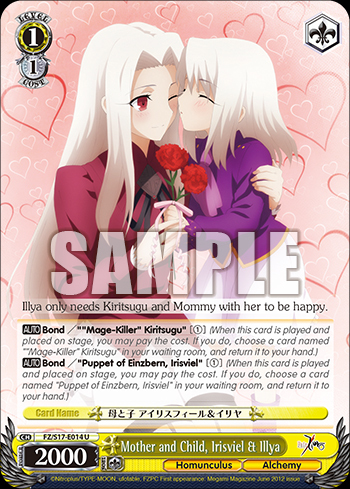 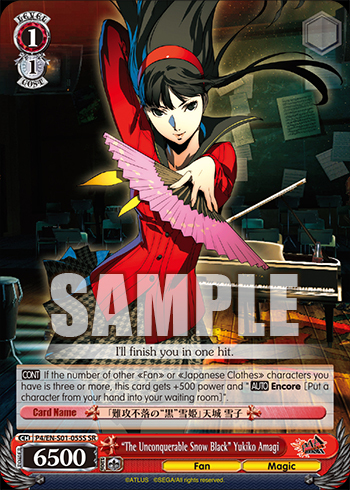 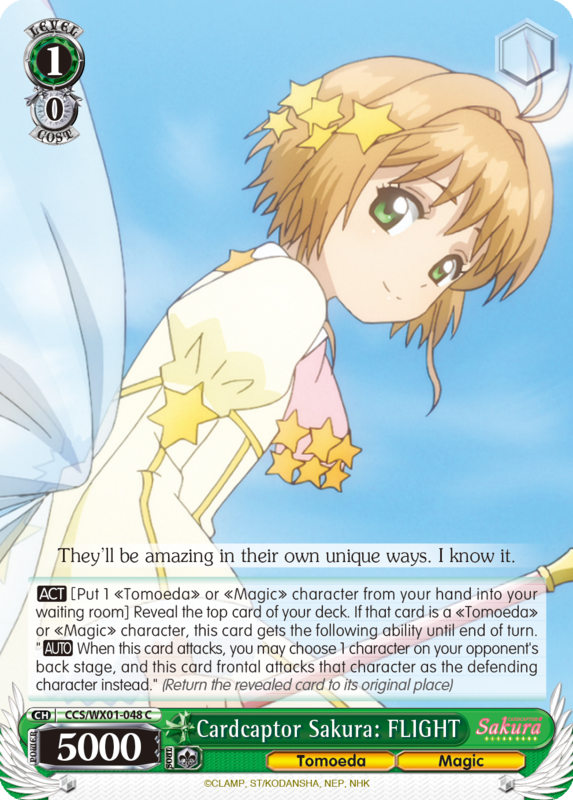 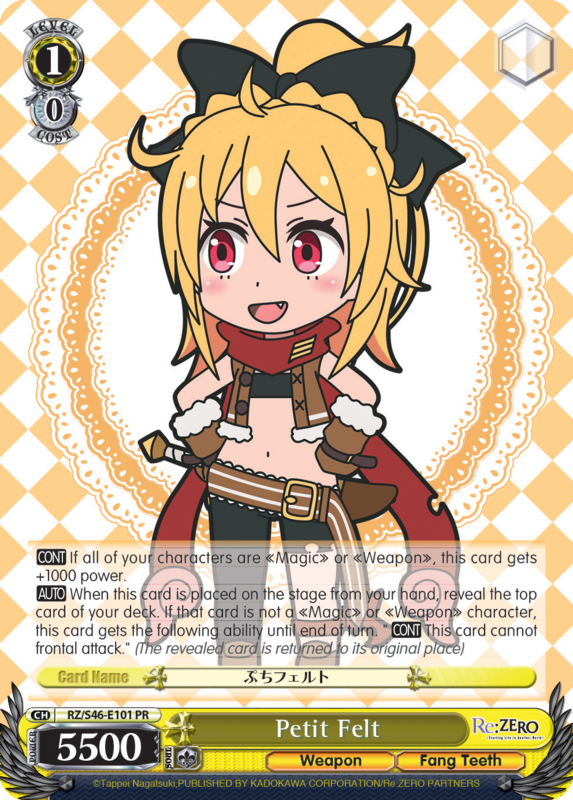 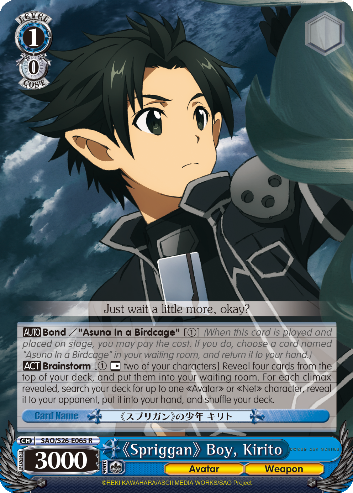 Errata Cards are cards which have errors borne of misprints or translation/wording errors. 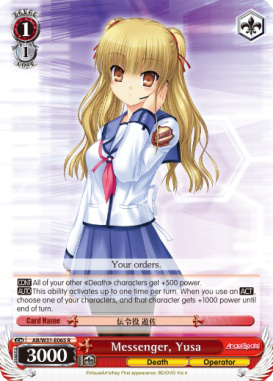 This fix is applied to all types of game formats and take precedence over the original wording of the card. 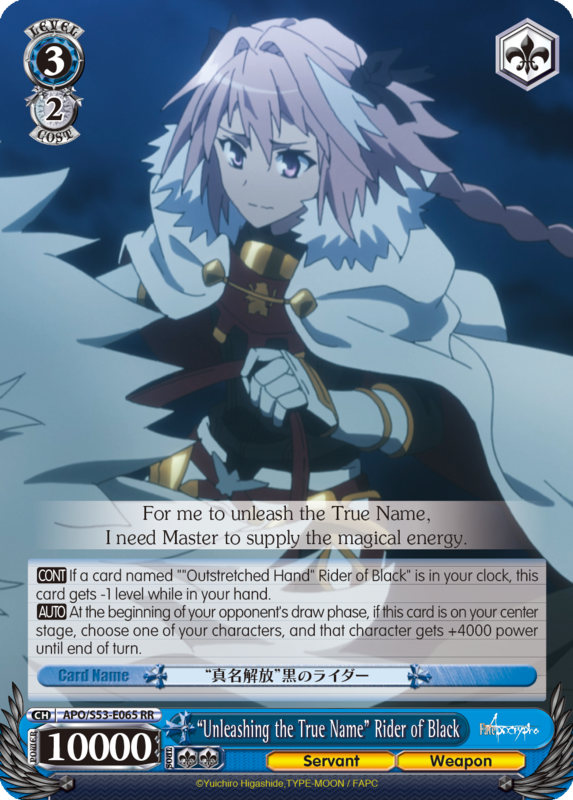 Let me show you Italia’s true power! 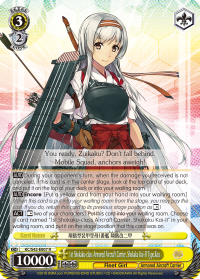 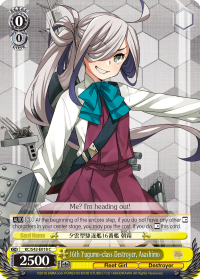 KanColle : Arrival! 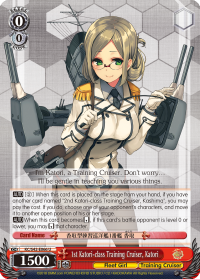 Reinforcement Fleets from Europe! 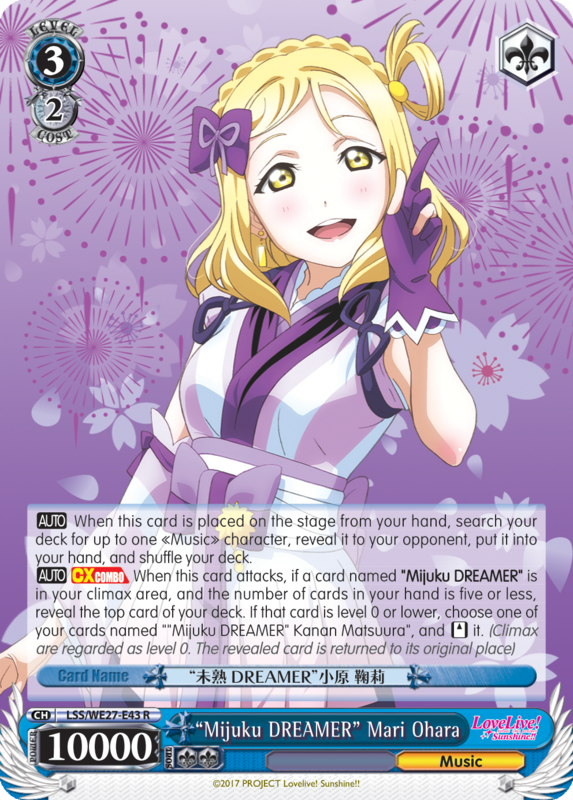 The Comeback icon is shown in the card’s reminder text. 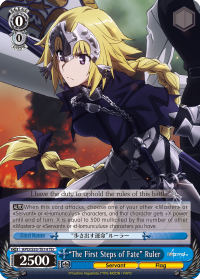 The Gate icon should be shown instead. 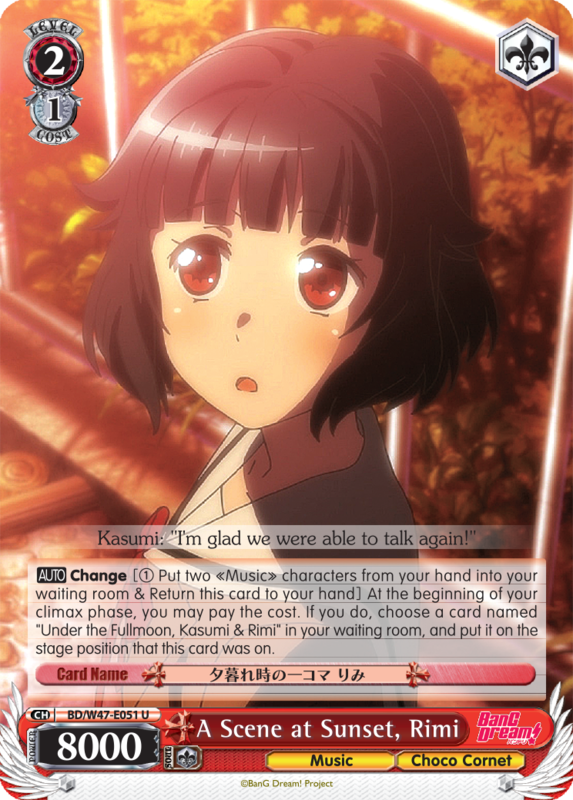 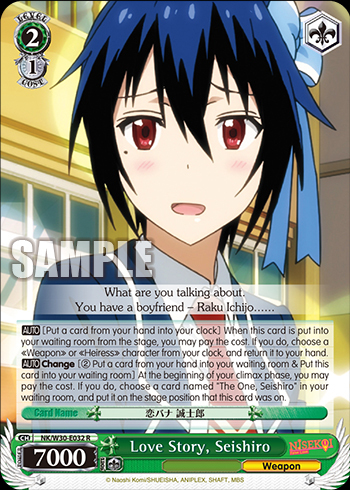 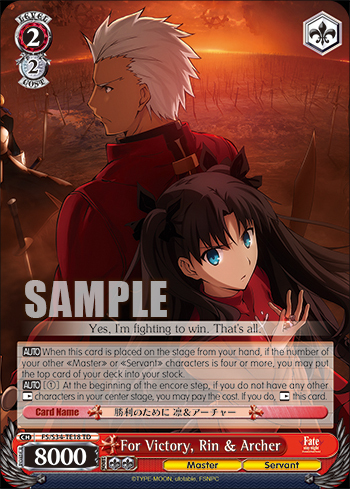 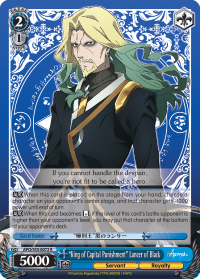 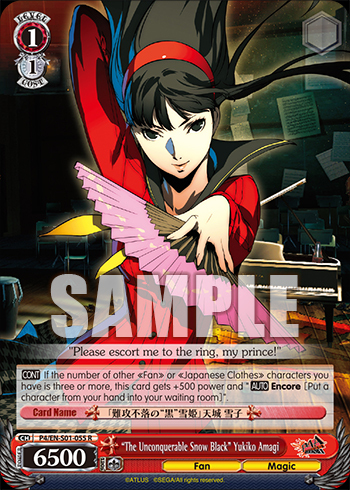 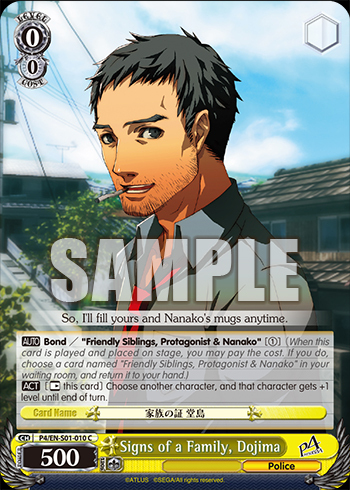 The character name is printed in bold instead of the climax name in the card text. 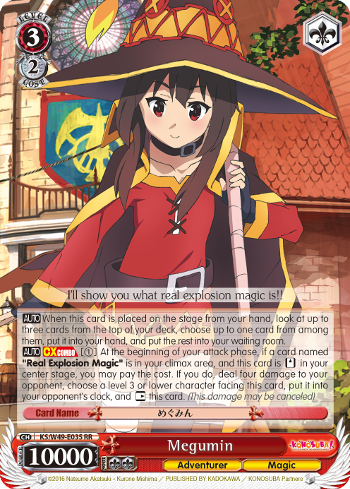 The climax name should be in bold instead. 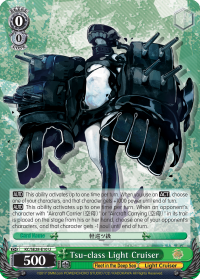 KanColle : Fleet in the Deep Sea, Sighted! 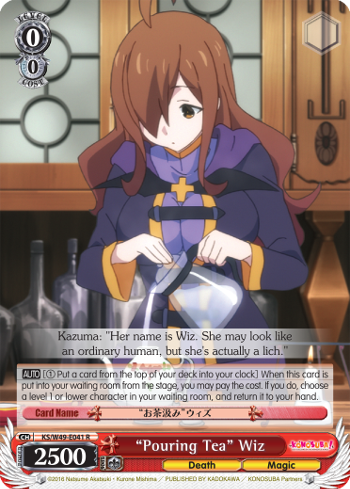 Card does not have copyright text. 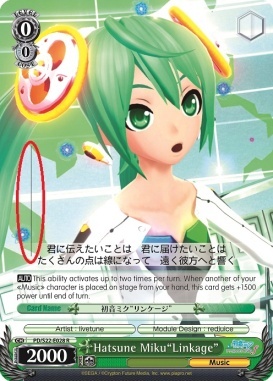 Copyright text inserted at the bottom of the card. 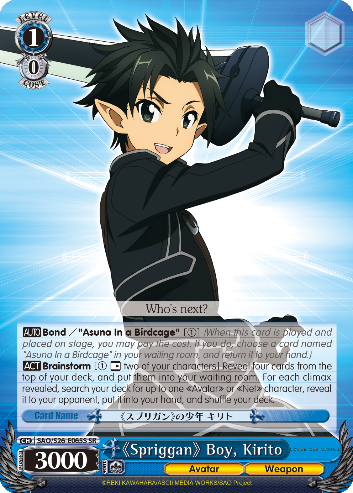 Accel World ? 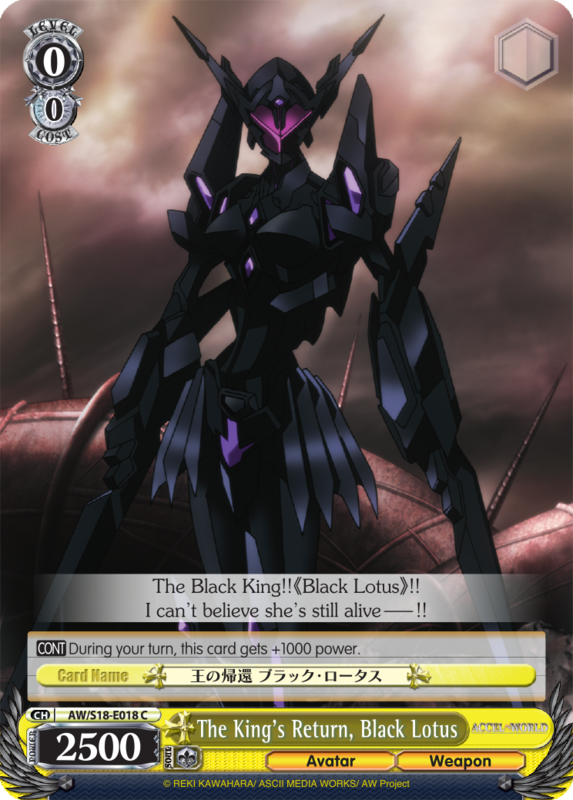 Infinite Burst ? 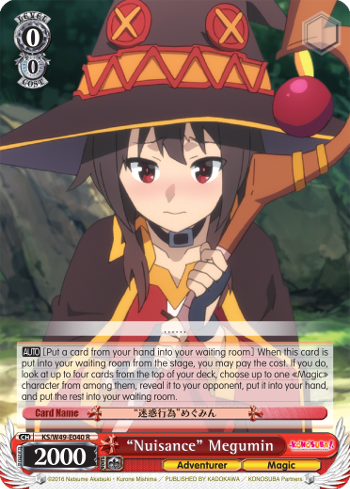 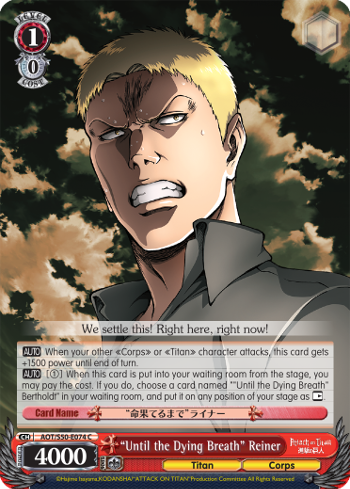 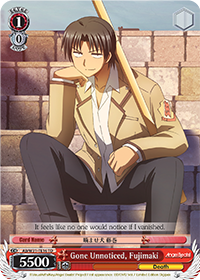 …If that card is a level 0 or lower character, your opponent may put up to one card from the top of your opponent’s deck into his or her stock. 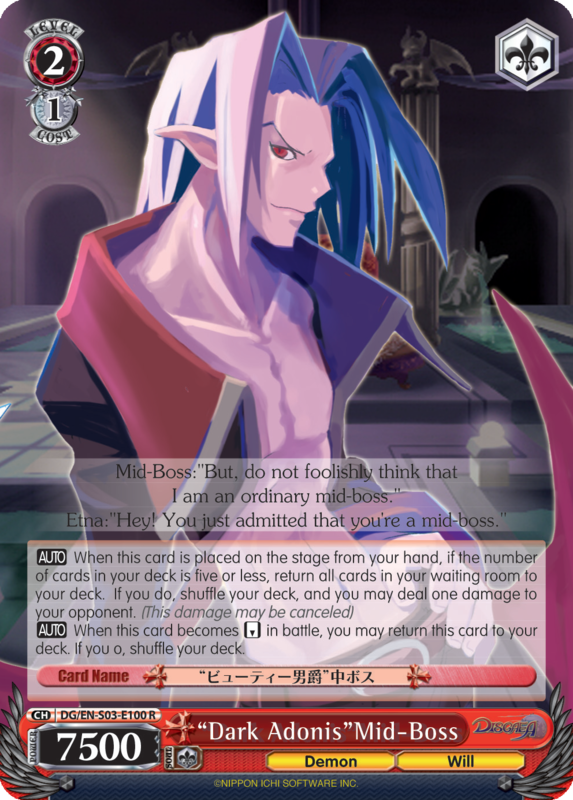 If your opponent does not, put the top two cards of your deck into your stock. 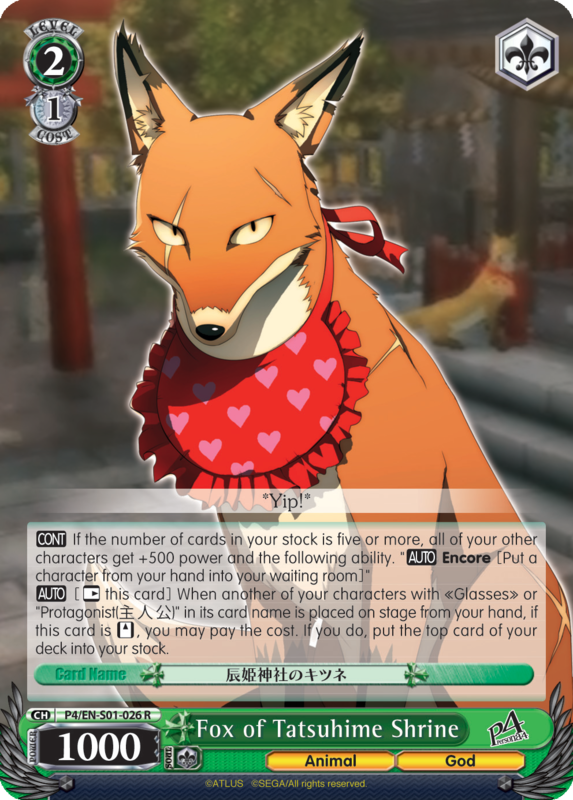 …If that card is a level 0 or lower character, your opponent puts up to one card from the top of your opponent’s deck into his or her stock. 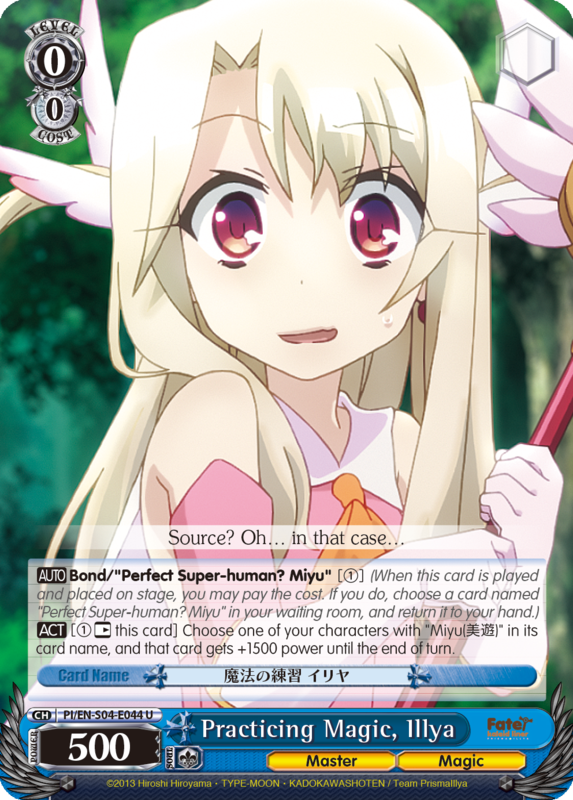 If it is not, put the top two cards of your deck into your stock. 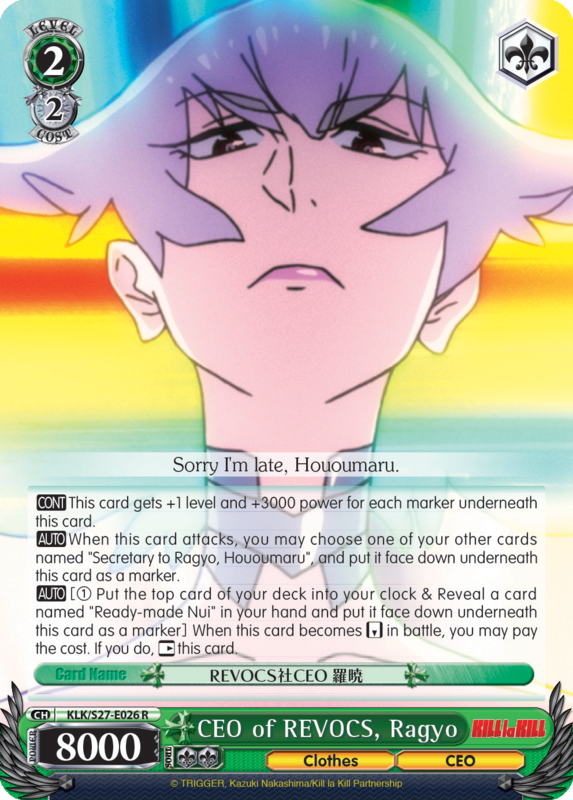 …reveal it to your opponent, and put the rest into your waiting room. 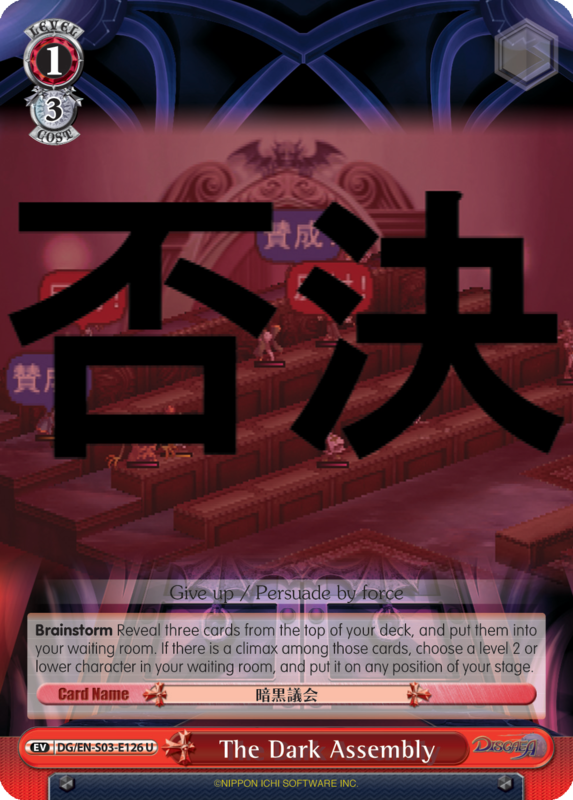 …reveal it to your opponent, put it into your hand, and put the rest into your waiting room. 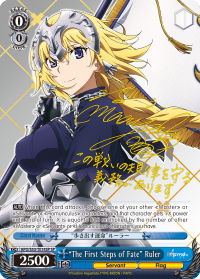 …X is equal to 1000 multiplied by the number of 《Adventurer》 or 《Goddess》 characters you have. 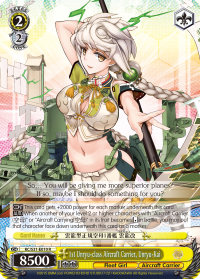 …X is equal to 1000 multiplied by the number of 《Adventurer》 or 《Goddess》 characters revealed among those cards. 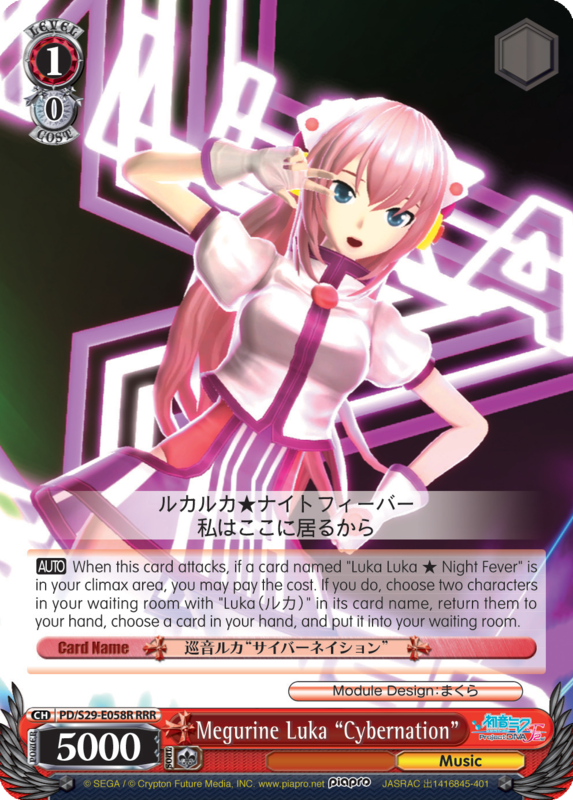 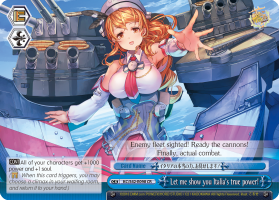 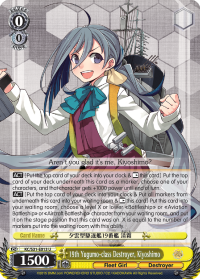 search your deck for up to one 《Music》 character, and put it into your hand. 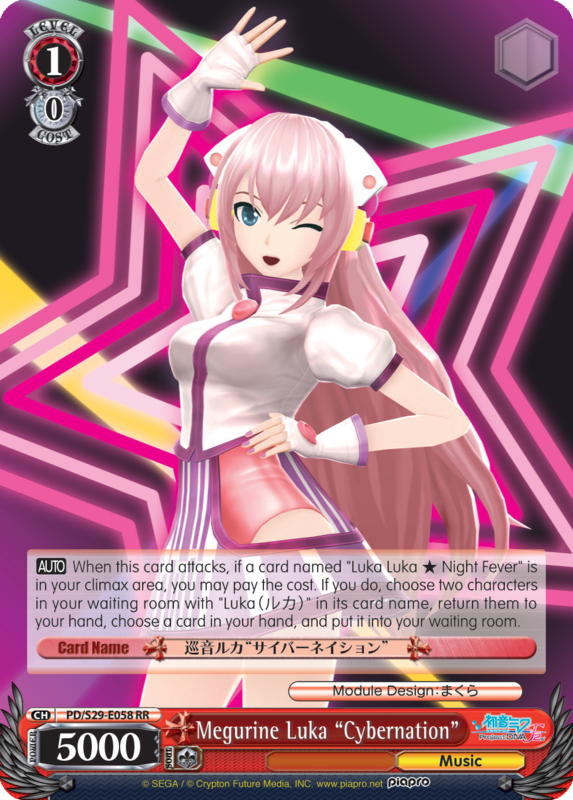 search your deck for up to one 《Music》 character, reveal it to your opponent, and put it into your hand. 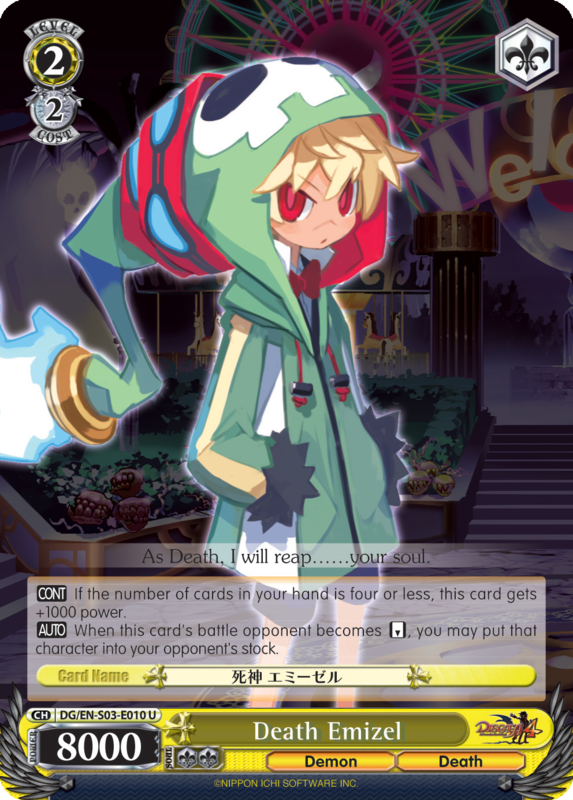 all of your other characters get 《Little Demon》. 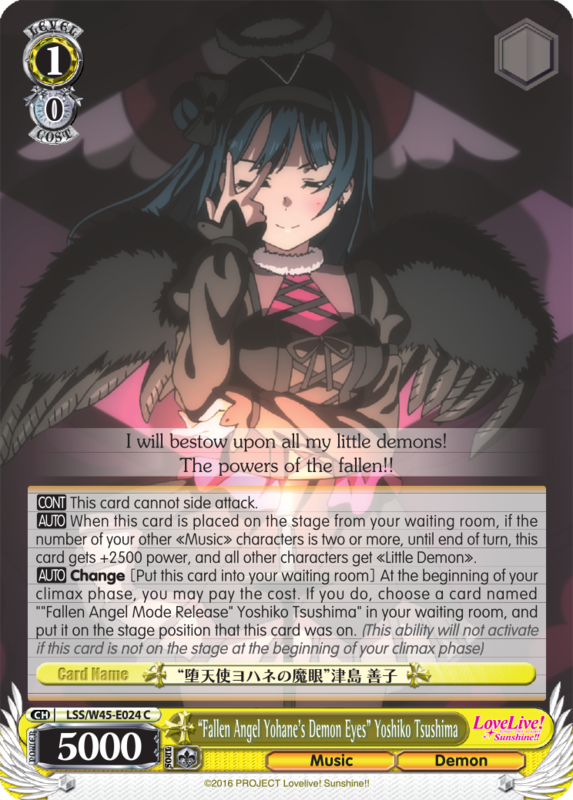 all other characters get 《Little Demon》. 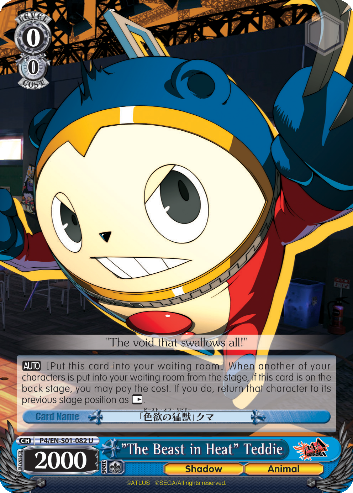 For each climax revealed, […], and put it into your waiting room. 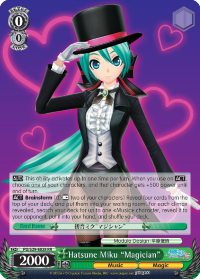 Shuffle your deck afterwards. 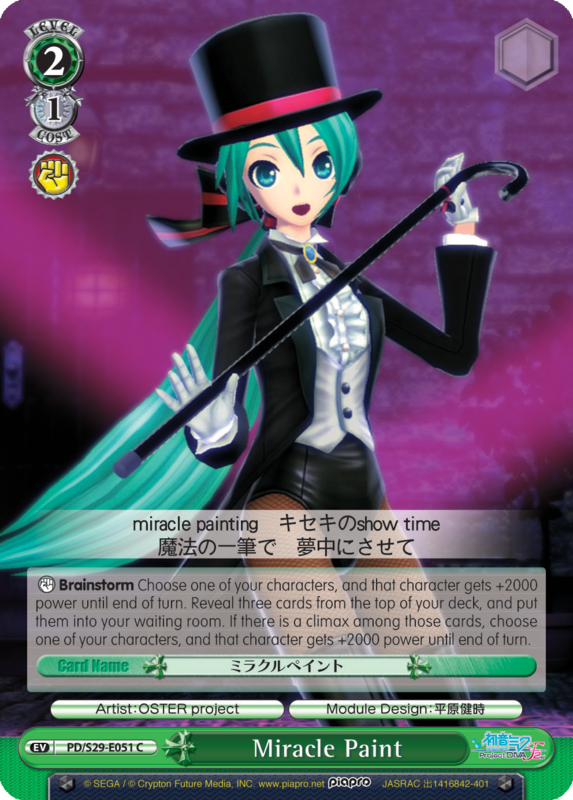 For each climax revealed, […], put it into your waiting room, and shuffle your deck. 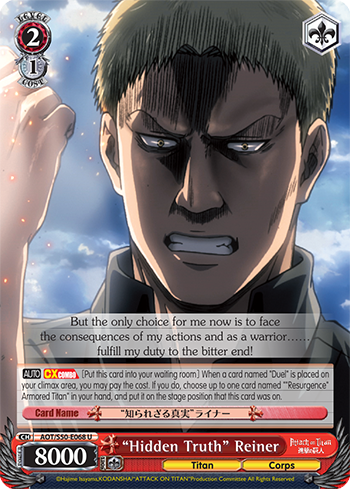 punish the humansfor their sins! 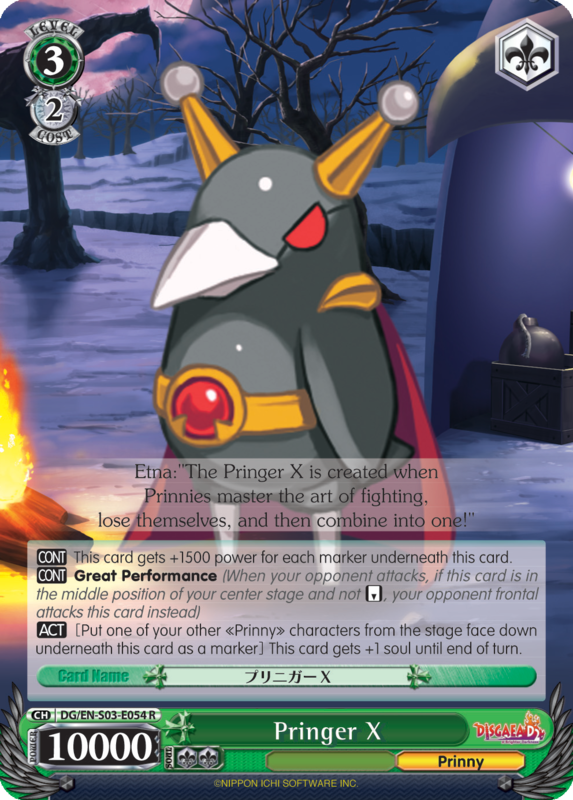 punish the humans for their sins! 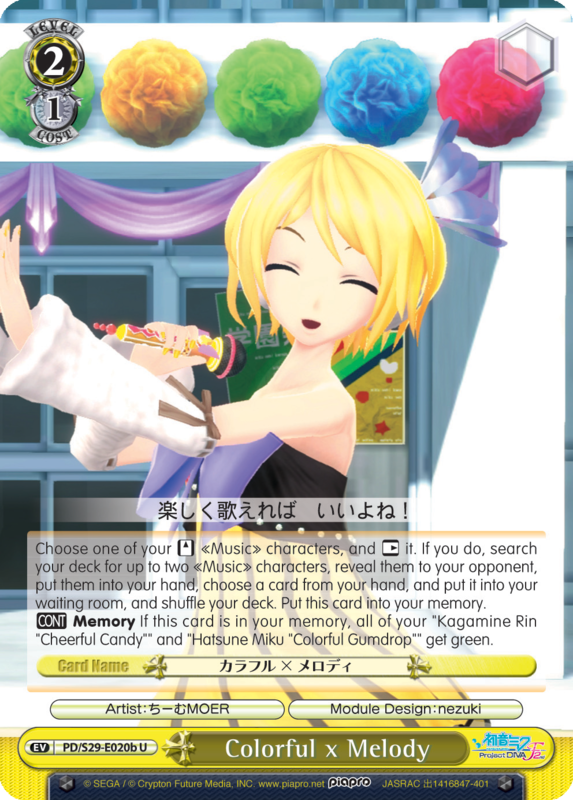 …, and put it into your waiting room. 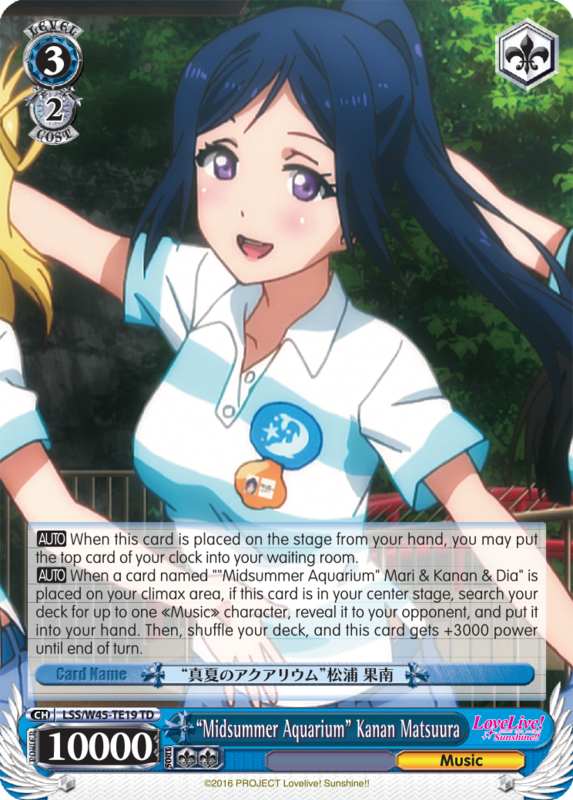 Shuffle your deck afterwards. 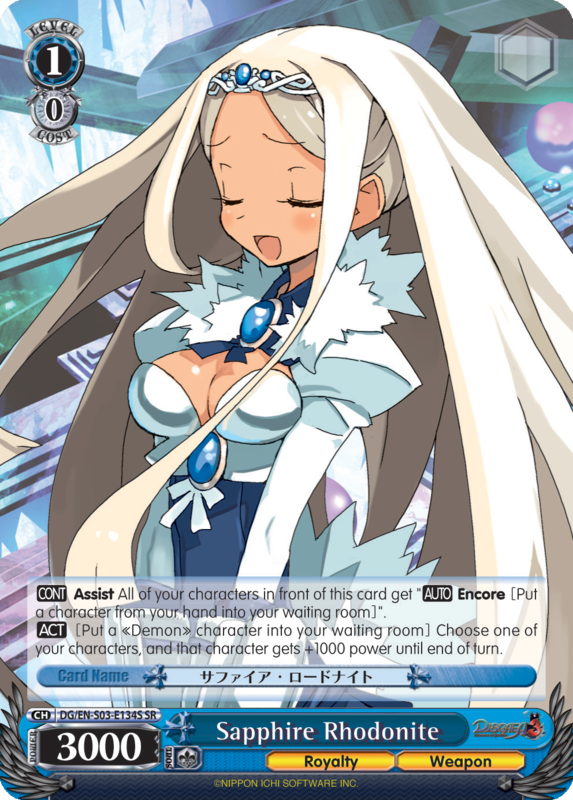 …, put it into your waiting room, and shuffle your deck. 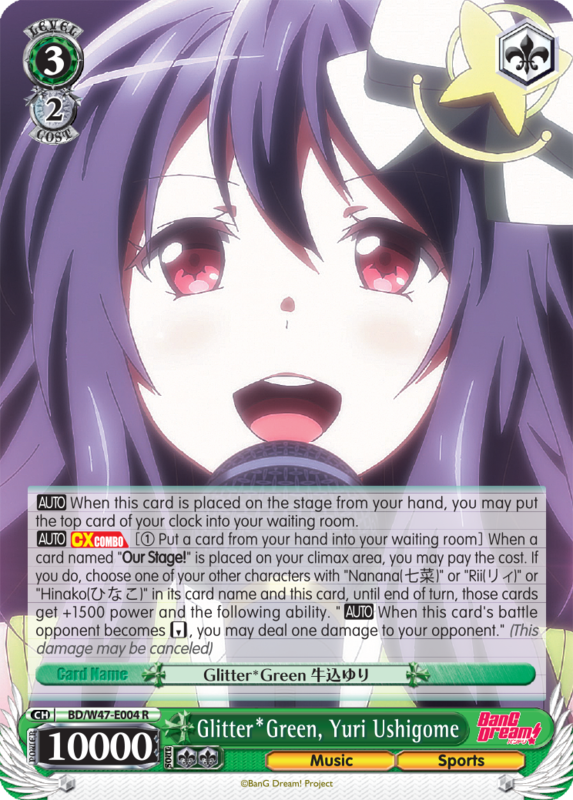 When this card is placed on the stage from your hand, you may pay the cost. 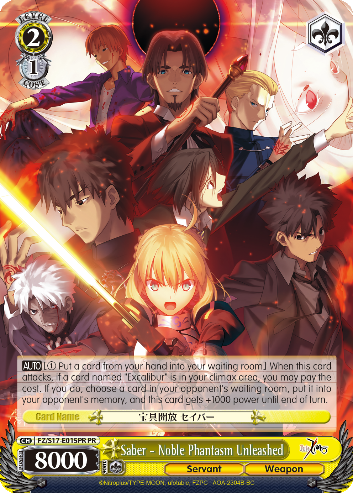 If you do, choose a 《Blood》 character in your waiting room, and return it to your hand. 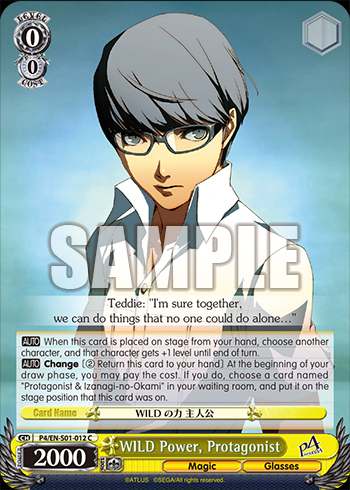 When this card is put into your waiting room from the stage, you may pay the cost. 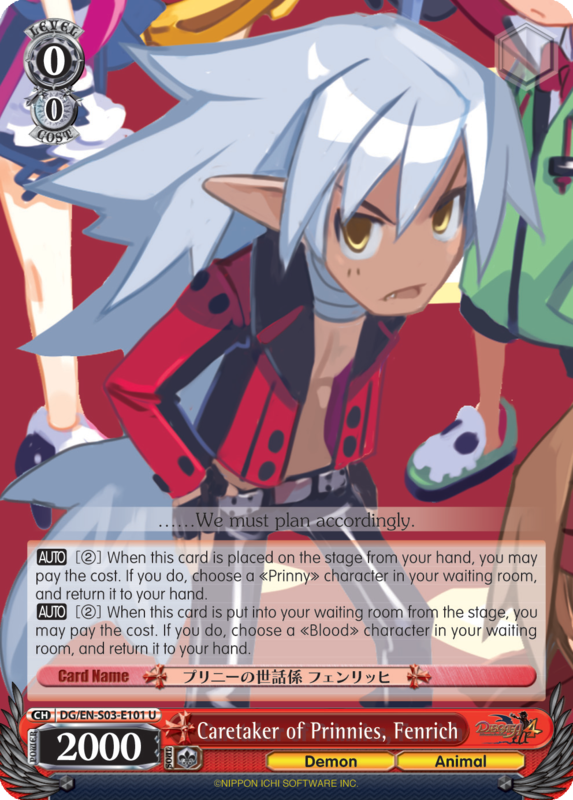 If you do, choose a 《Blood》 character in your waiting room, and return it to your hand. 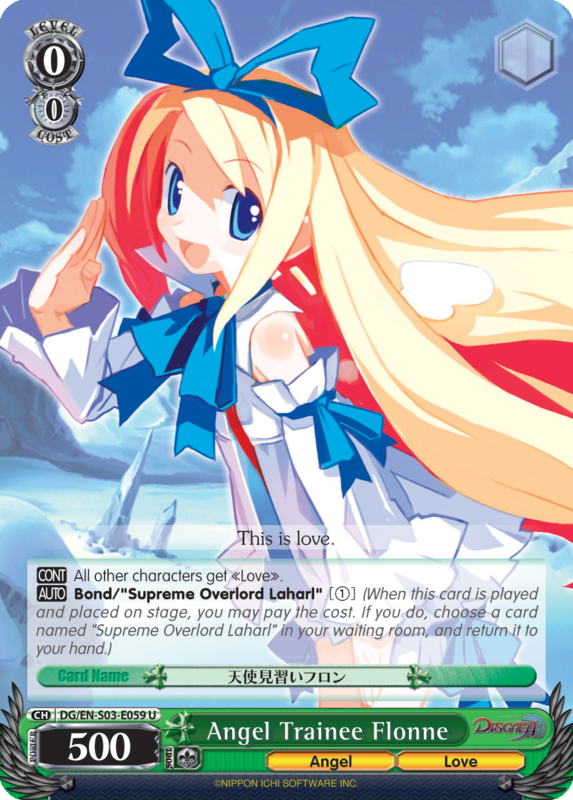 All of your other characters get 《Love》. 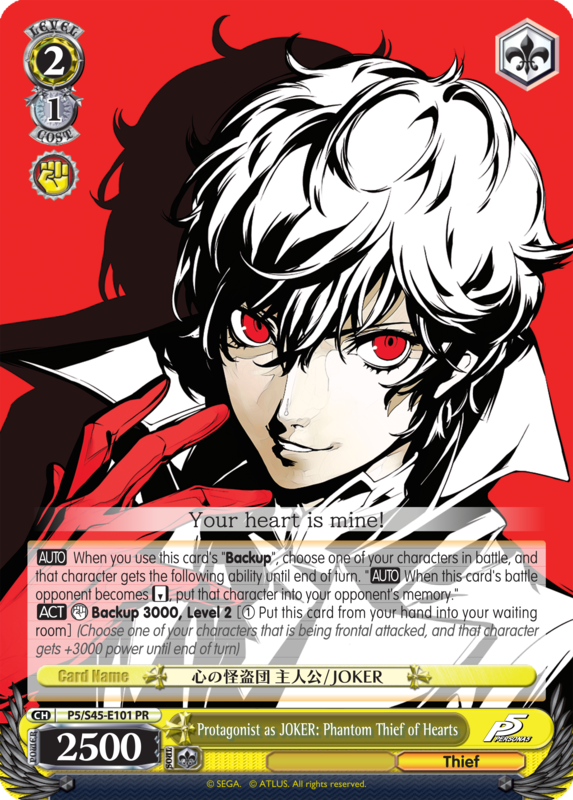 All other characters get 《Love》. 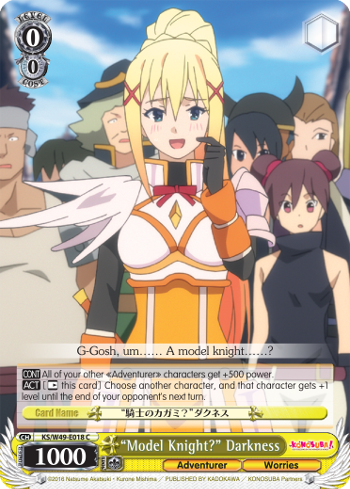 Choose one of your characters, and that character gets +2000 power. 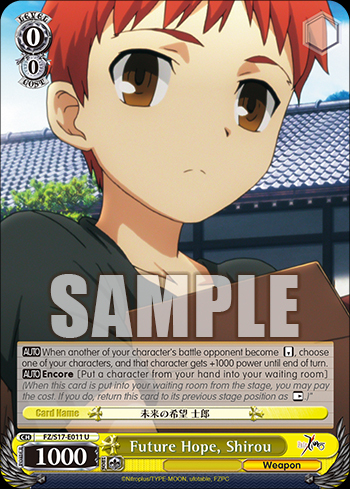 Choose one of your characters, and that character gets +2000 power until end of turn. 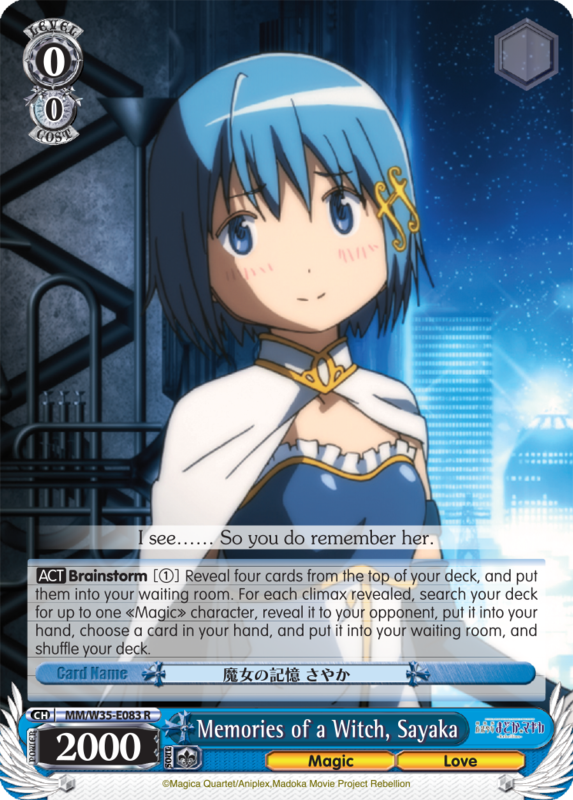 If you do, shuffle your deck, and deal one damage to your opponent. 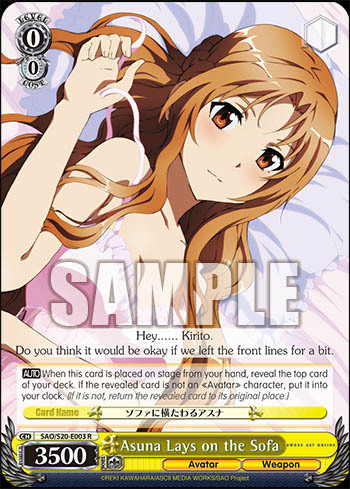 If you do, shuffle your deck, and you may deal one damage to your opponent. 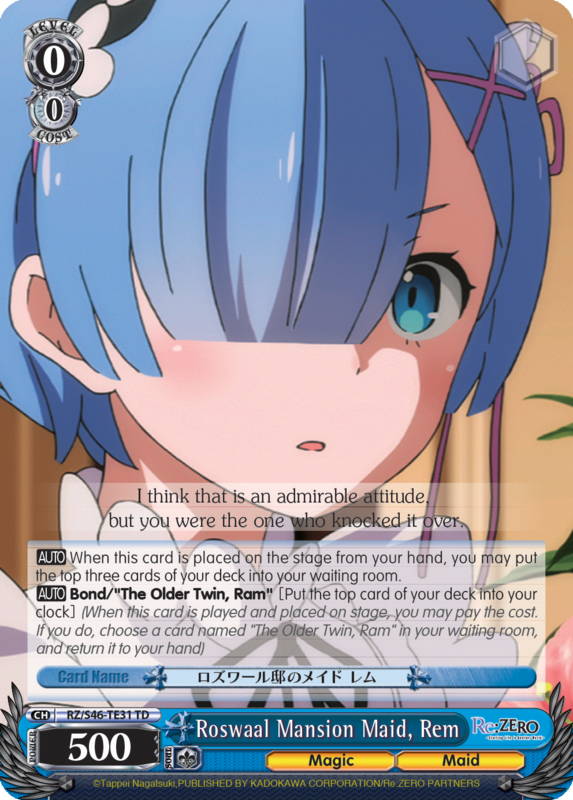 …that card gets +500 power until the end of turn. 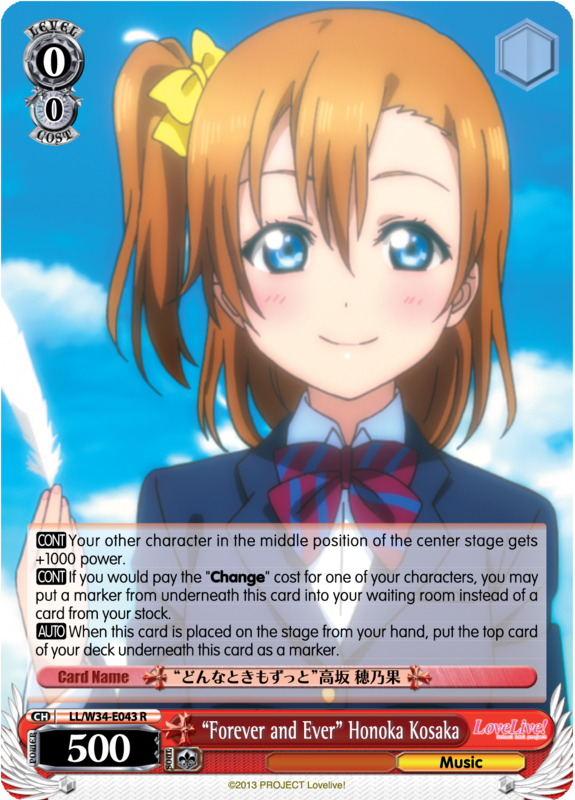 …that card gets +1500 power until the end of turn. 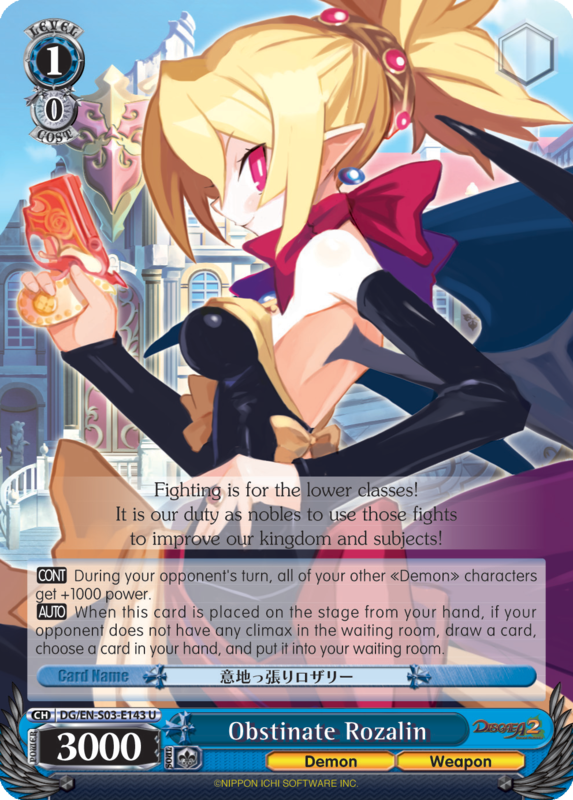 …opponent, and put it into your hand. 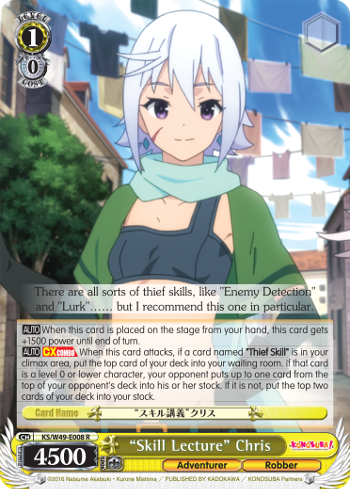 Shuffle your deck afterwards. 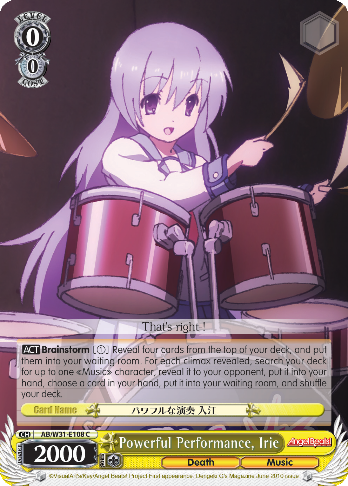 …opponent, put it into your hand, and shuffle your deck. 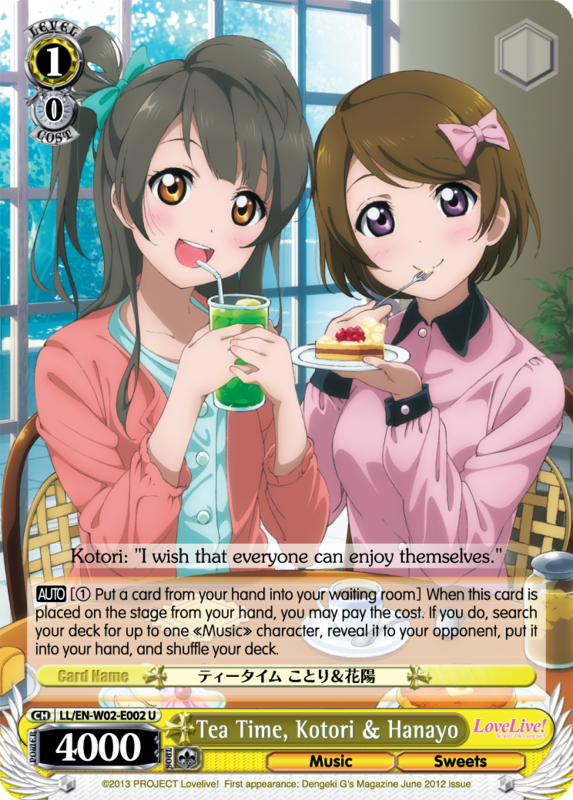 Special Attribute: Japanese ・ Tea. 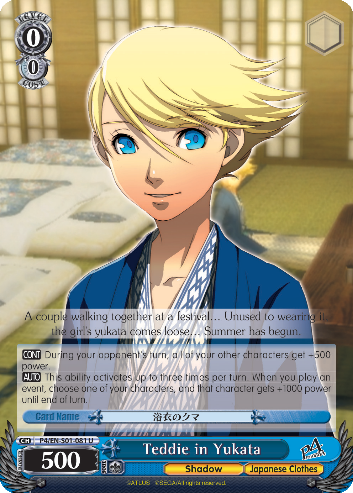 Special Attribute: Japanese Clothes・ Tea. 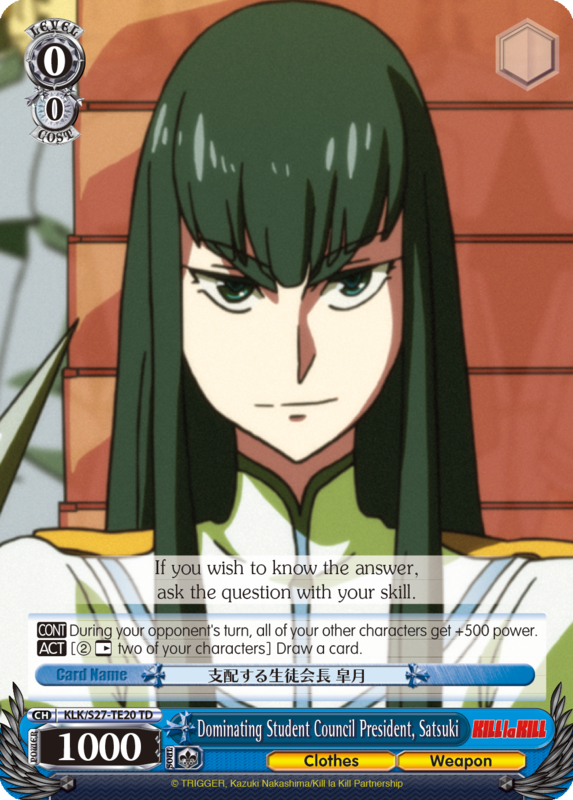 … and that character gets power +1000 until end of turn. 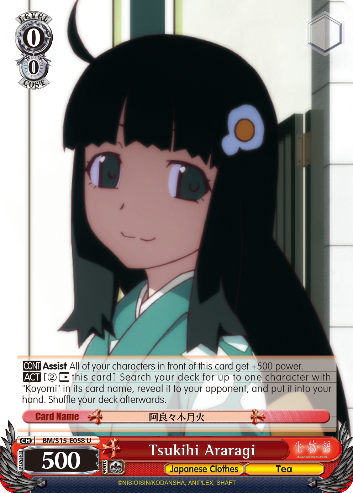 … and that character gets +1000 power until end of turn. 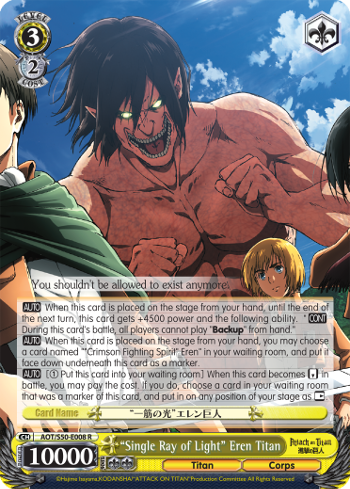 … from hand, draw a card, choose one of your characters, and that character gets +2000 power and +1 soul until end of turn. 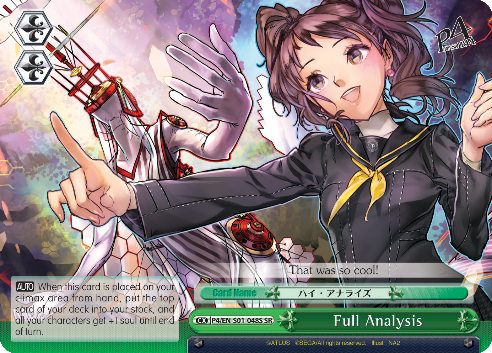 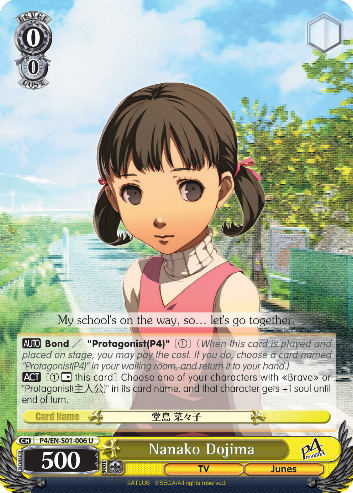 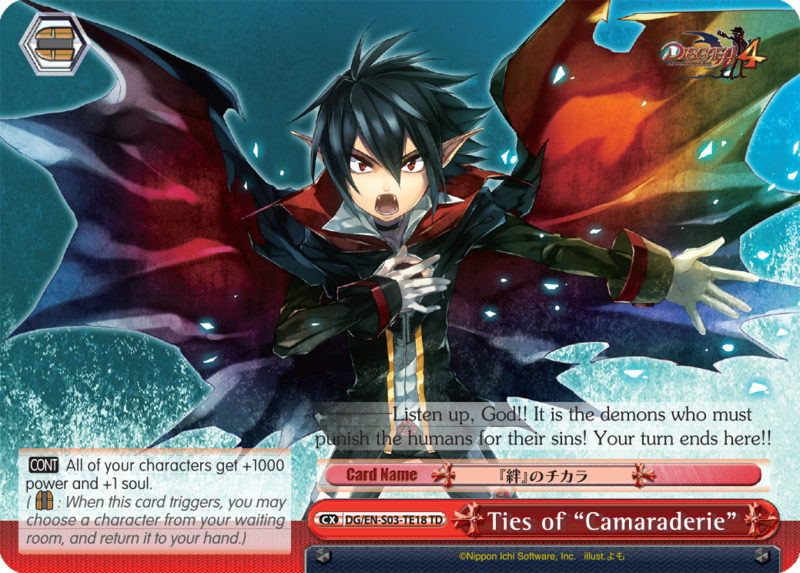 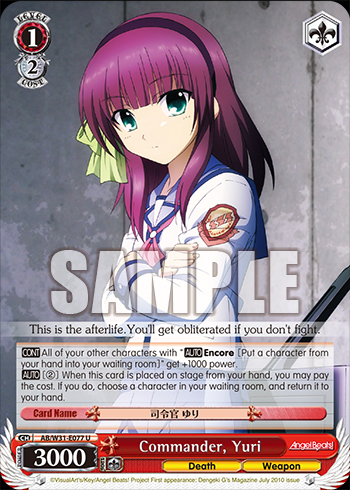 …from hand, put the top card of your deck into your stock, and all your characters get +1 soul until end of turn. 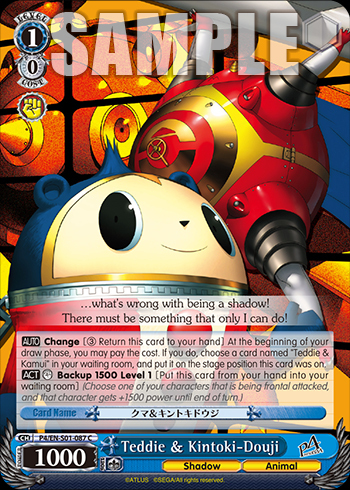 …put it into your waiting room. 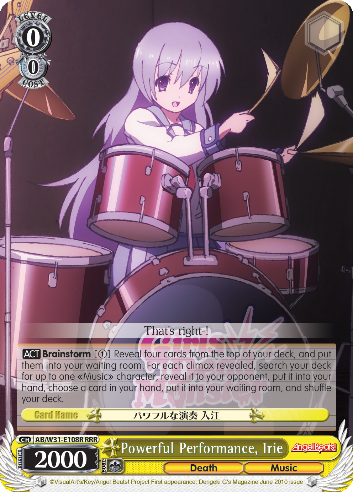 Shuffle your deck afterwards. 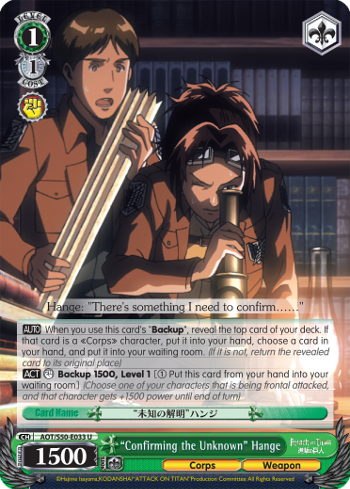 …put it into your waiting room, and shuffle your deck. 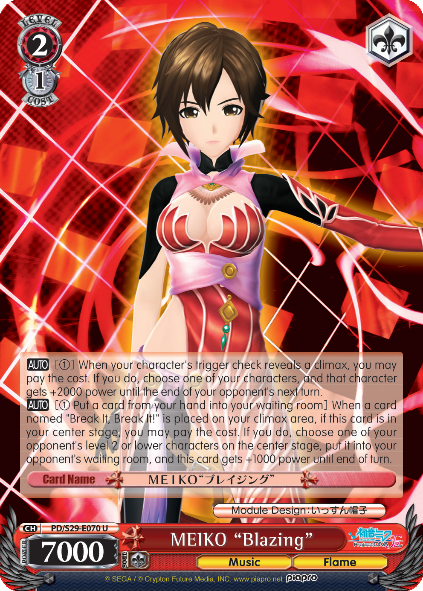 Your other character in the middle position of the center stage gets +1000 until end of turn. 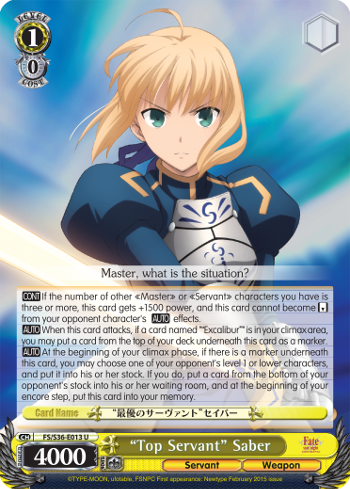 Your other character in the middle position of the center stage gets +1000 power. 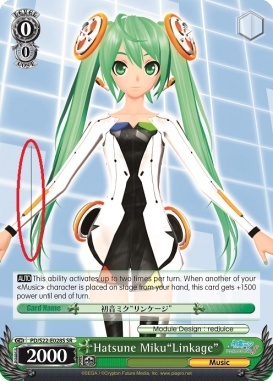 Booster Pack Hatsune Miku -Project DIVA- ? 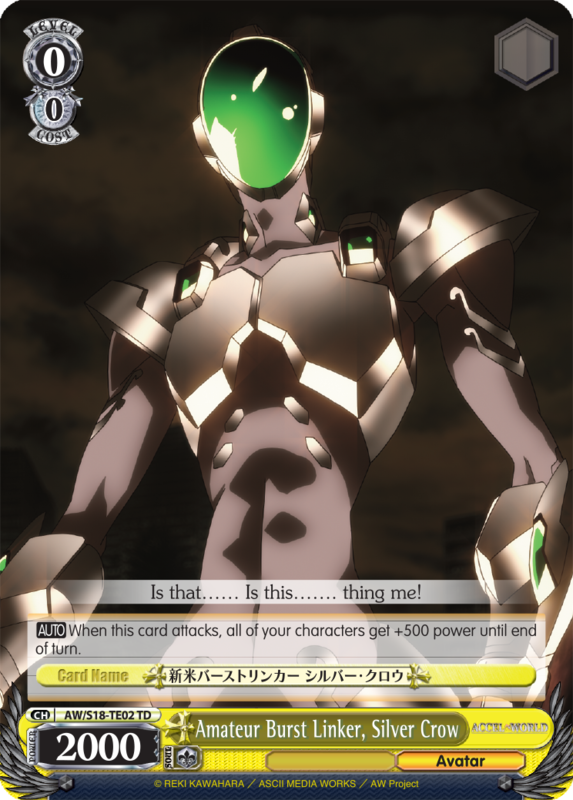 …card name get +2000 power. 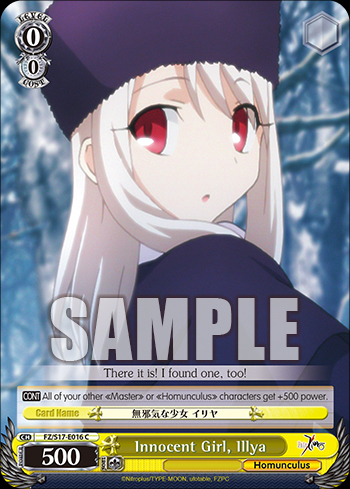 …card name get +2000 power until end of turn. 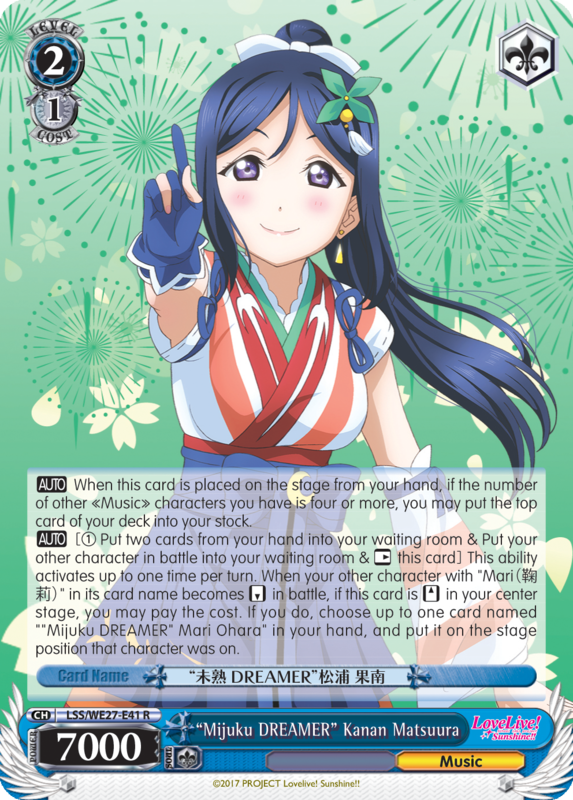 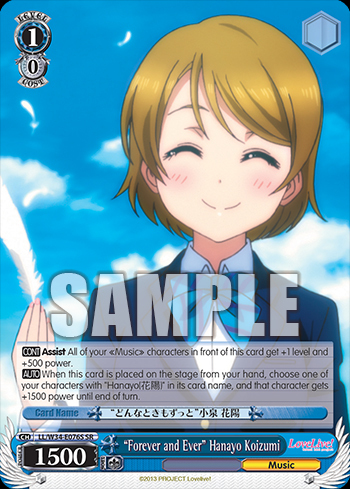 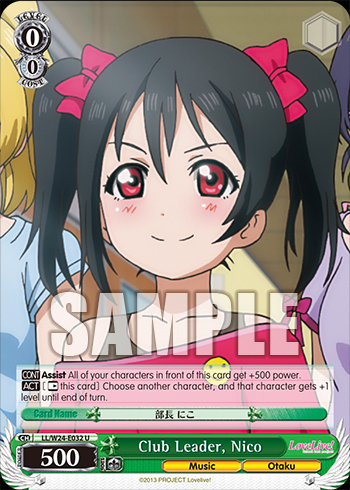 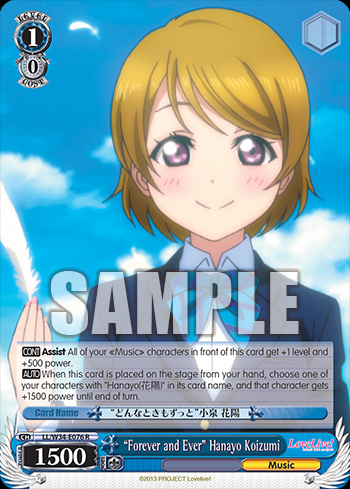 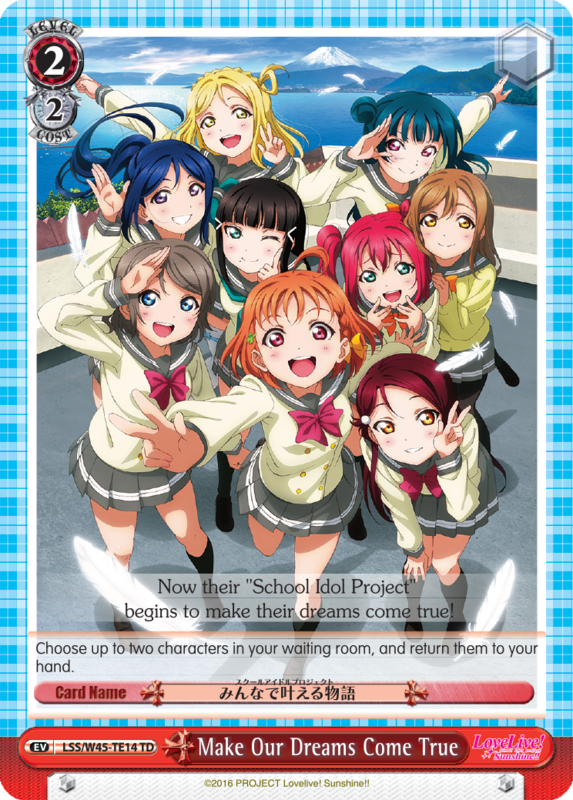 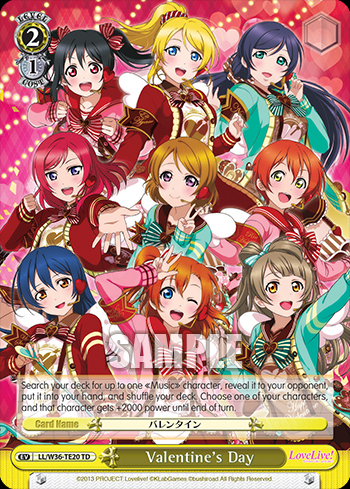 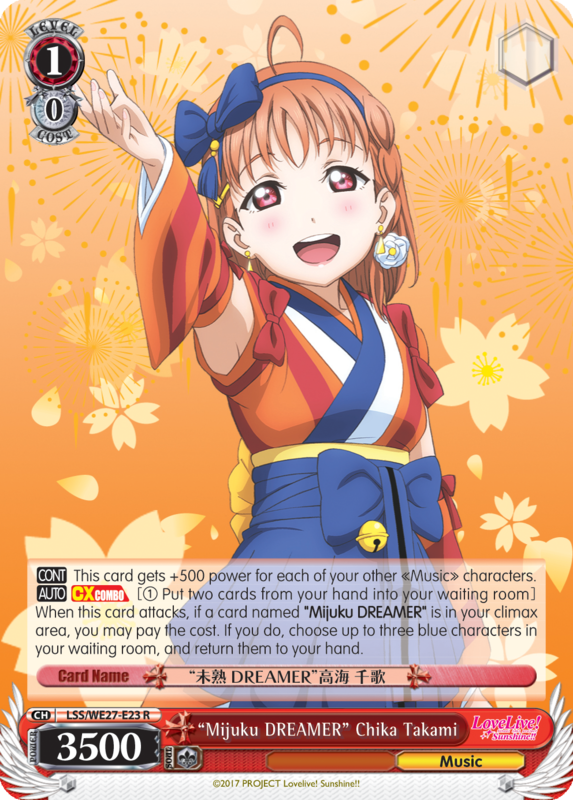 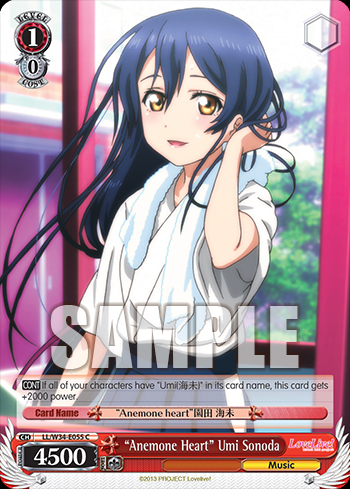 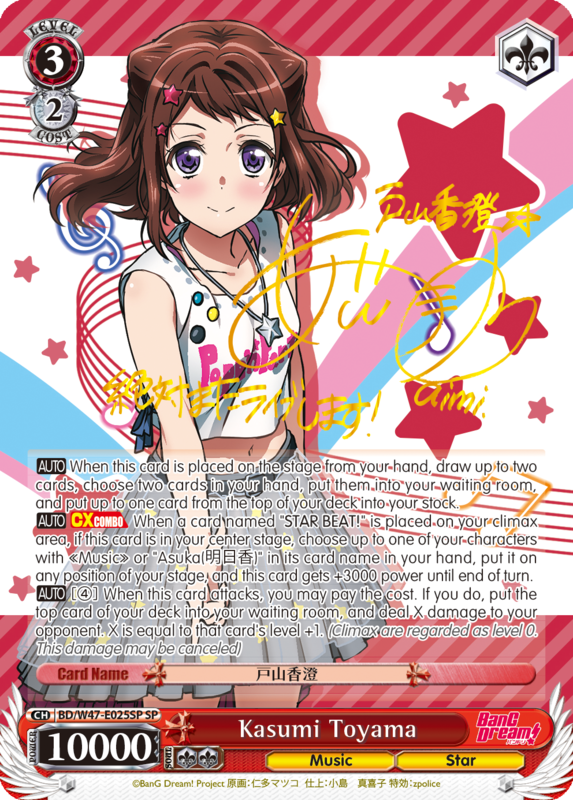 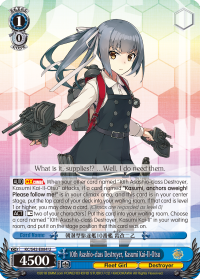 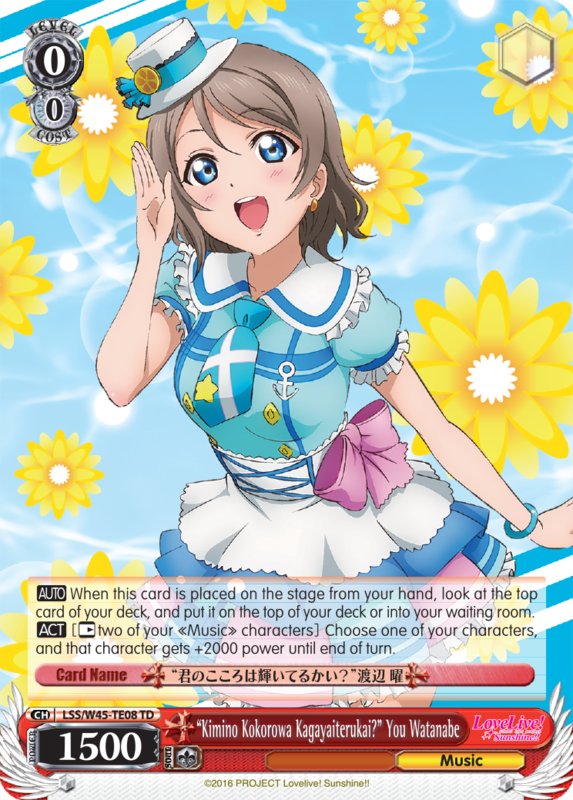 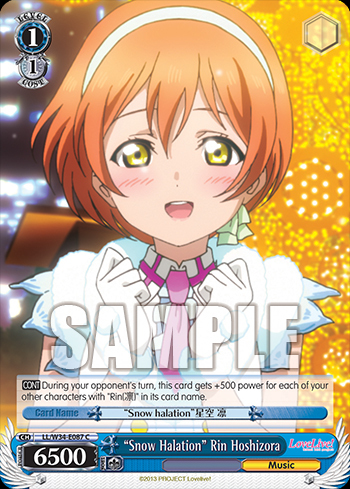 October 15, 2014 – Booster Pack Love Live! 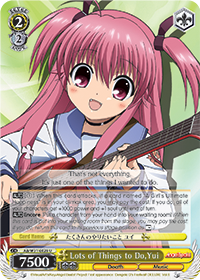 Special Attribute: Music ・ Animal. 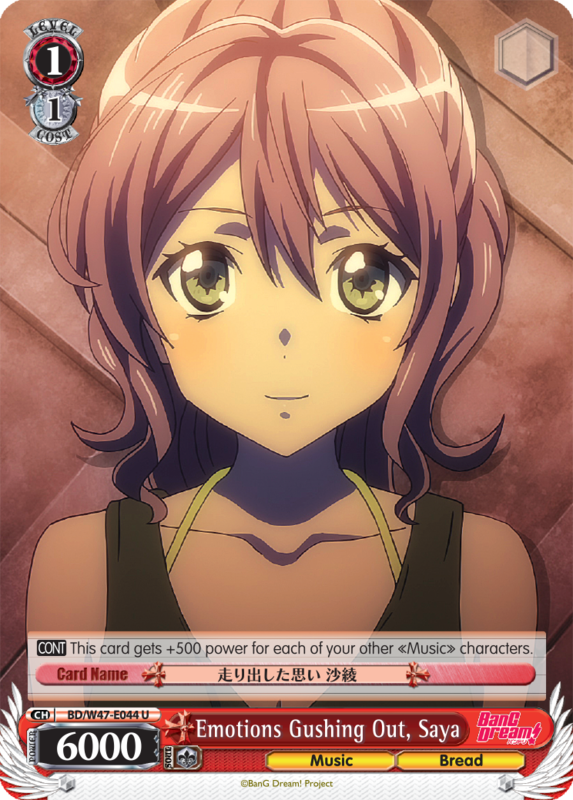 Special Attribute: Music ・ Swimsuit. 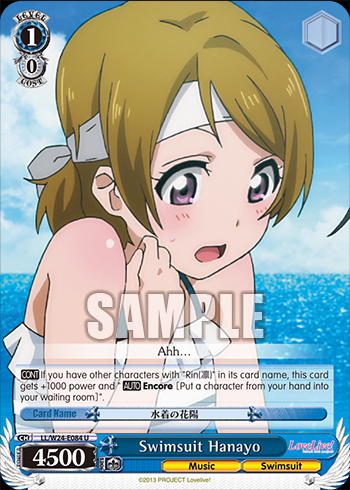 * This misprint will be corrected in the subsequent reprint(s) of this product. 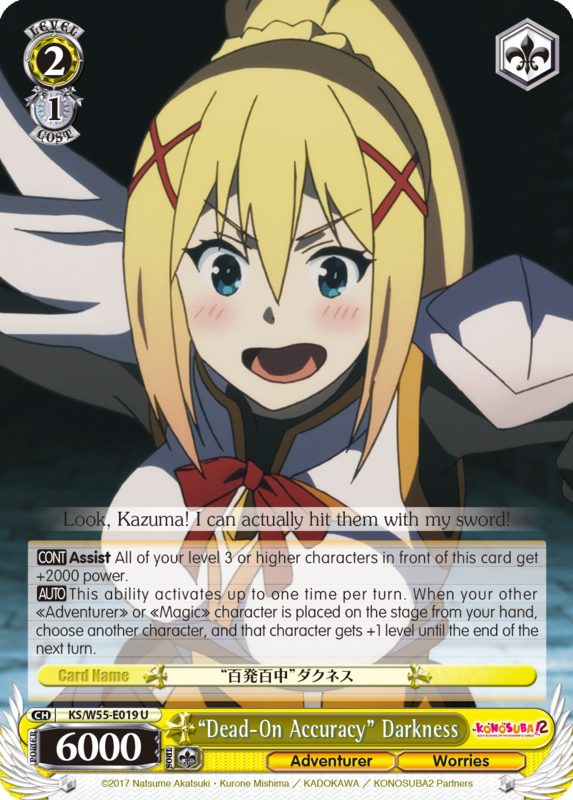 …and that character gets +1000 power. 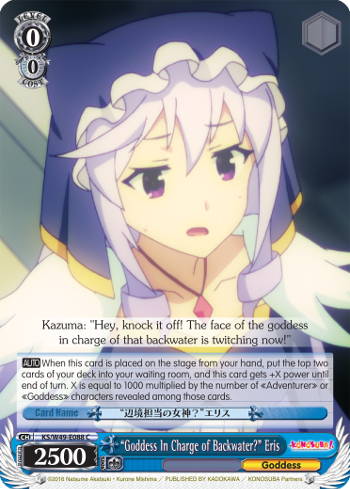 …and that character gets +1000 power until end of turn. 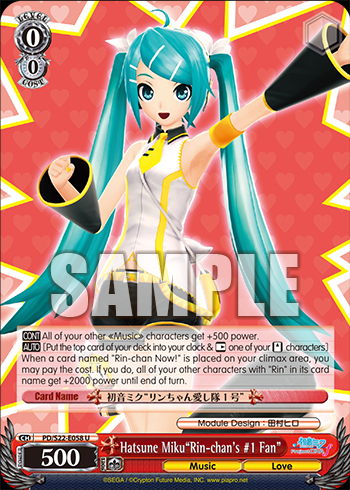 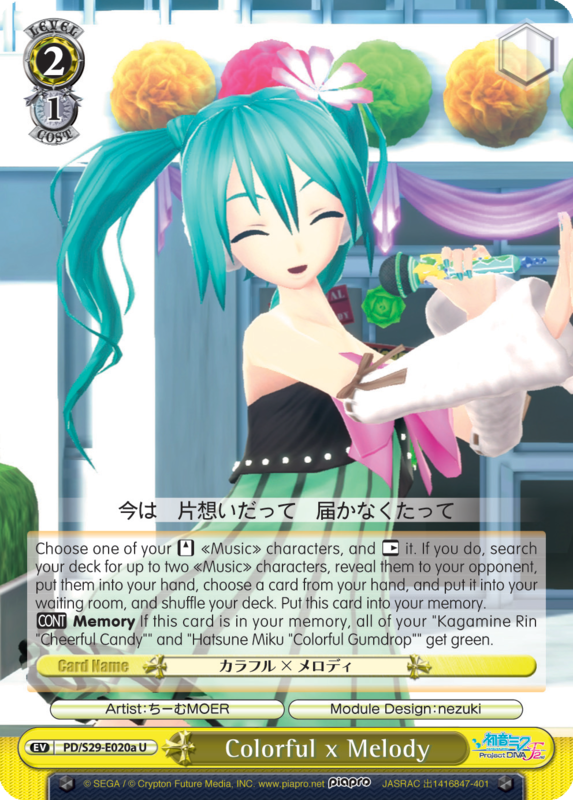 August 26, 2014 – Booster Pack Hatsune Miku -Project DIVA- ? 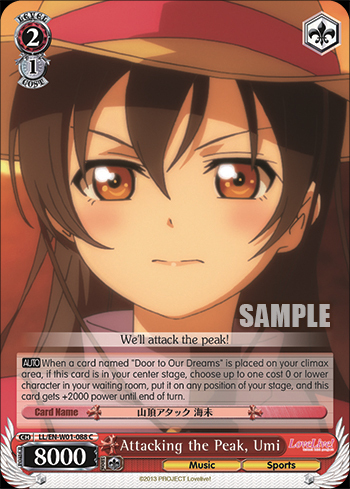 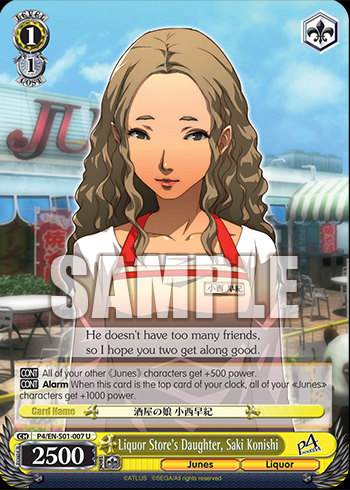 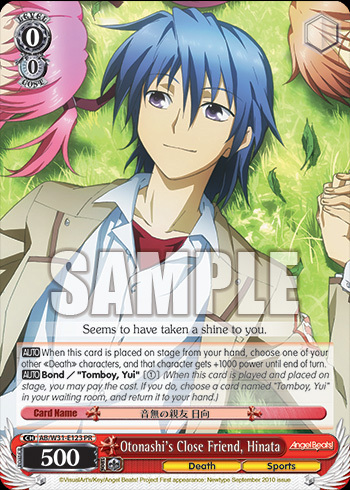 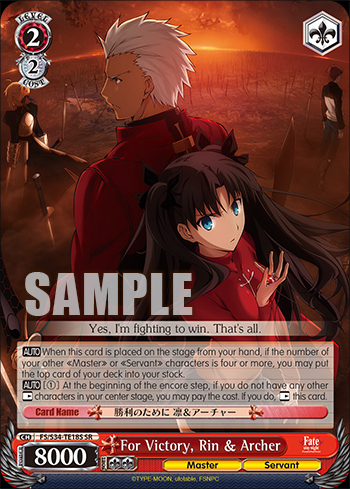 Due to a printing error, a line is visible on the left side of both versions of this card. 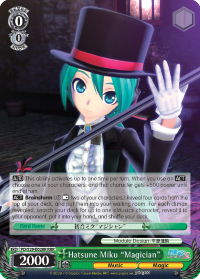 Errata Exchange for PD/S22-E028 R & PD/S22-E028S SR 「Hatsune Miku”Linkage”」 will be available at Thank You Festival and all World Championship 2014 Regional Qualifiers. 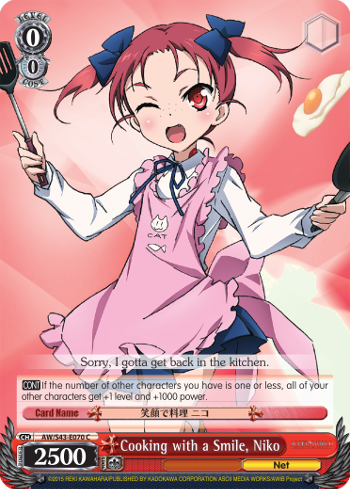 There should be no Counter sign. 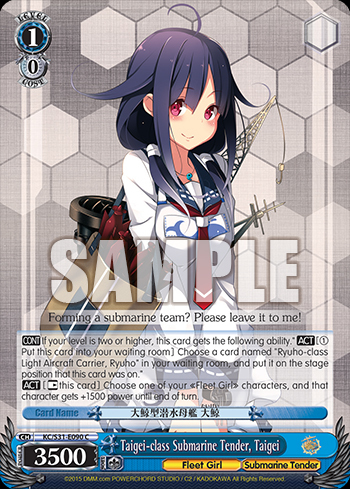 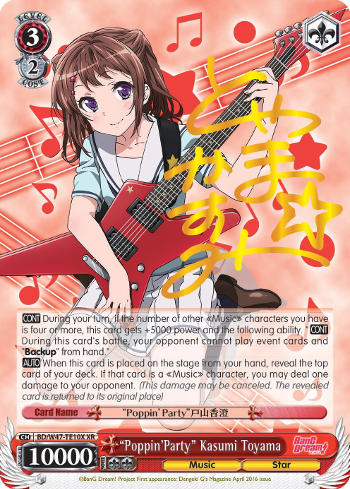 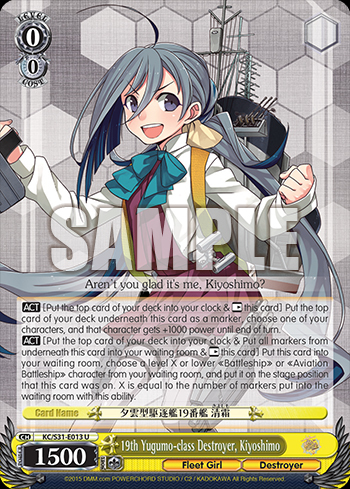 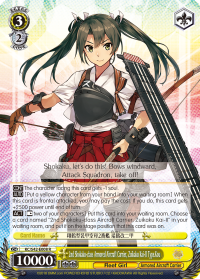 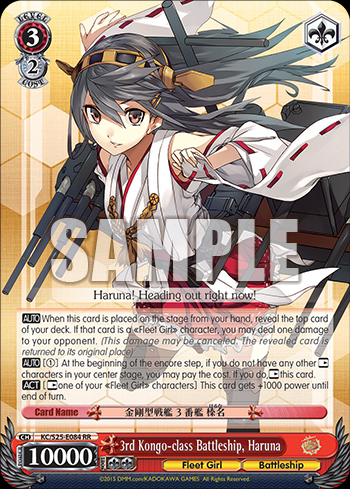 When this card attacks, if a card named “NADEKO Snake” is in your climax area, search your deck for up to two cards named “Girl Wound By a Snake, Nadeko Sengoku”, reveal them to your opponent, and put them into your hand. 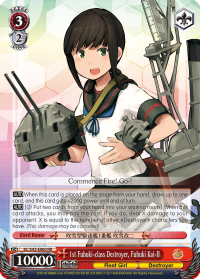 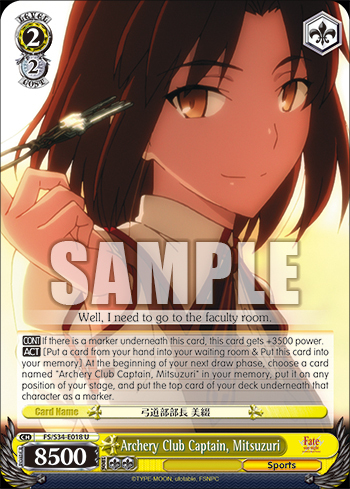 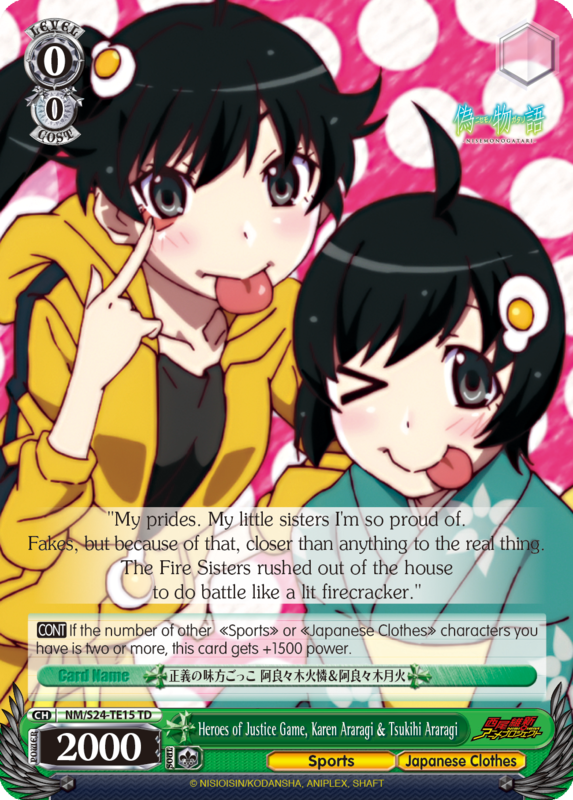 When this card attacks, if a card named “NADEKO Snake” is in your climax area, search your deck for up to two cards named “Girl Bound By a Snake, Nadeko Sengoku”, reveal them to your opponent, and put them into your hand. 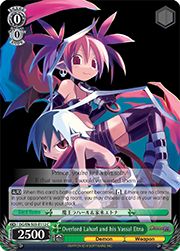 Search your deck for up to one card with “Pina” in its card name, reveal it to your opponent, and put it into your hand. 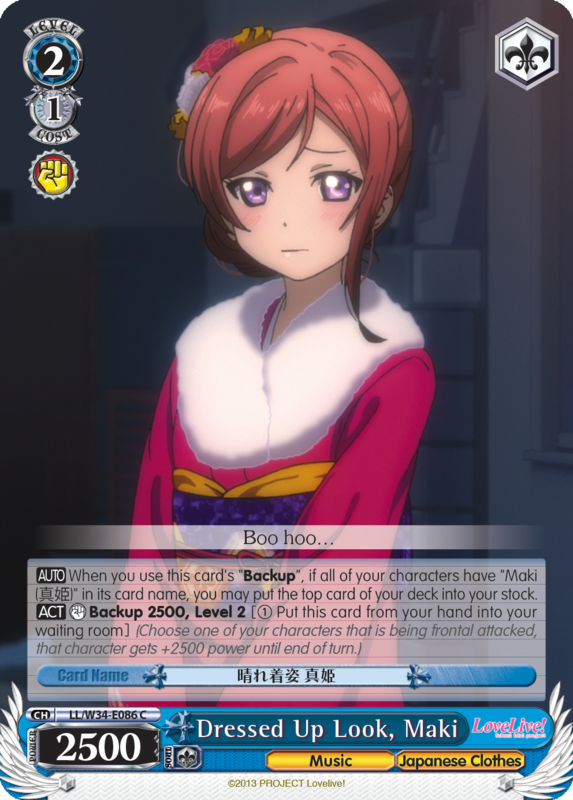 Shuffle your deck afterwards. 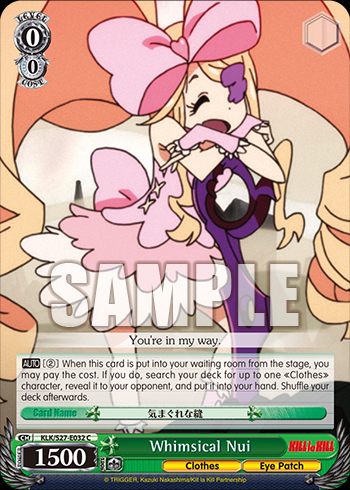 Search your deck for up to one character with “Pina” in its card name, reveal it to your opponent, and put it into your hand. 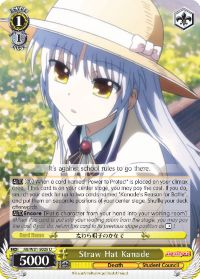 Shuffle your deck afterwards. 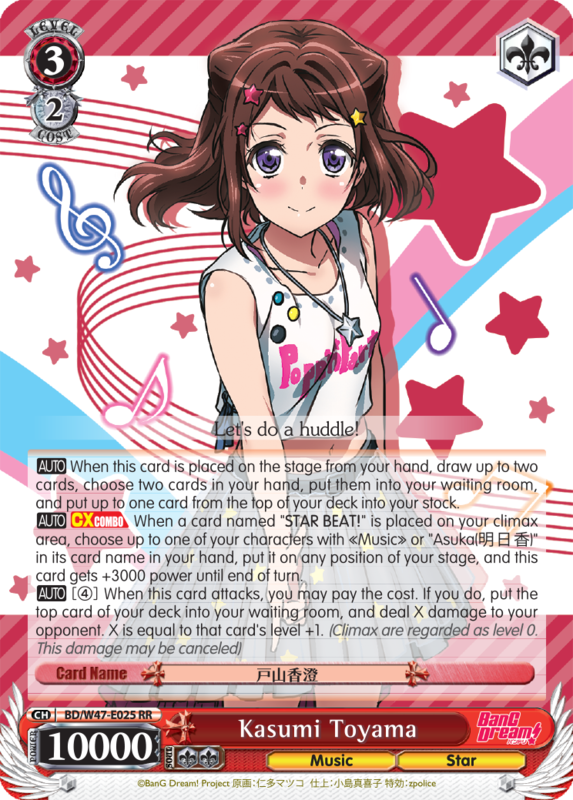 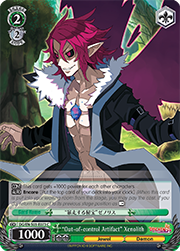 【AUTO】: When this card is frontal attacked, look at the top card of your deck, and put it on the top or the bottom of your deck. 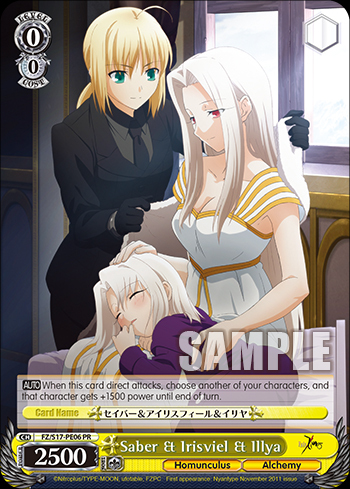 【AUTO】: When this card is frontal attacked, look at the top card of your deck, and put it on the top of your deck or into your waiting room.